An incident where the husband of a dead woman had assaulted the driver of the hearse carrying her body and the driver losing control of the vehicle had resulted in the hearse toppling over on the road in Galenbindunuwewa on Wednesday. This was reported from Sivalakulam Urakote where a woman had died on Wednesday morning and her husband and relatives had handed over the body for embalming to an undertaker. Once this task was done, the undertakers had arranged to deliver the body to the deceased woman's house. 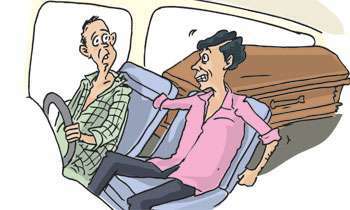 The deceased woman's husband too had accompanied the coffin and was seated by the side of the driver in the hearse. The husband had been sobbing and wailing during this journey and when it approached the 17th mile post, he started attacking the hearse's driver. Due to this sudden incident, the driver lost control of the vehicle, which skidded off the road and turned turtle. The impact however did not cause any damage to the coffin or to the corpse within. SOMETIMES THERE WOULD HAVE BEEN THREE COFFINS INSTEAD OF ONE. ANYWAY, WE MUST APPRECIATE THE SERVICES OF THE OWNER OF THIS FUNERAL PARLOR.